Create reading challenges and set a goal for the amount of books to be read in the challenge. Then when you publish a review, you can assign that book to a reading challenge. Then watch your reading challenge progress go up automatically! The plugin comes with a widget, which allows you to show off your reading challenge progress. It will display progress bars for each of your current challenges. These progress bars will update automatically each time you add a new book to your challenge. You can also use a variety of different shortcodes to display your challenges. You can display an overview of each challenge, which includes the challenge title, image, host, your progress, and more. You can also use a shortcode to output a list of each book that’s part of a particulate challenge. The plugin comes with a settings panel, which allows you to customize the look of your progress bars. You can change the background and text colours and turn the animation off or on! This add-on is integrated with the Ultimate Book Blogger Plugin. It will create a new section that you can add to your book info, which will automatically output a list of all the challenges your book contributed to. 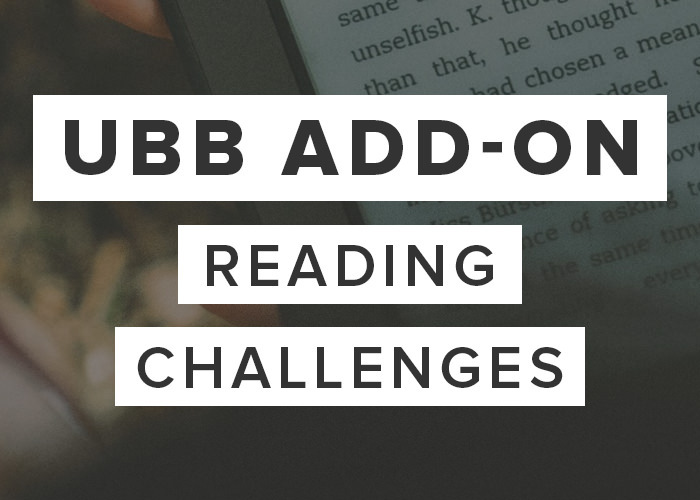 The Reading Challenges add-on has extensive documentation to help guide you through the set-up process and help you understand how the plugin works. This add-on comes with automatic updates. Upon activating your license key in the settings panel, you will receive automatic updates through WordPress for 12 months! This add-on requires 3.0.7+ of the Ultimate Book Blogger plugin. Tweak: Private posts now count towards the reading challenge count. New: Added new "Hide" setting for each reading challenge. This excludes the challenge from the Reading Challenges widget. Fix: Progress bar stripes/animations not working. Tweak: Reading challenge progress is now updated more frequently. Fix: Book not being added to challenge list if Reading Challenge text box wasn't filled out and only one book was added to the post. Fix: Improved sub-books compatibility, particularly when first book is not part of a challenge but subsequent books are. Tweak: Migrated challenge meta to term meta table. Tweak: Removed placeholder text from challenge start and end date fields. Reading challenges are now integrated with the multi-book feature. There's an extra text box added to sub-books where you can enter the names of corresponding challenges (similar to other taxonomies like author/series/etc.). Fixed a problem with [challenge-books overview="yes"] shortcode not working correctly. The [challenge-books overview="yes"] shortcode now displays the challenge overview as intended (oops!). Added the UBB_Book object as an extra parameter to the ubb_get_value filter. Added the Challenge Progress widget, which was missing. Fixed a problem where progress bars were stretching if your progress went over 100%. Wrapped the host output in stripslashes to allow for HTML in the display. [challenge-overview] images are now resized down to 180px wide. This previously only worked for individual displays. Added an extra parameter to the [challenge-overview] shortcode, like so: [challenge-overview showempty="yes"] That will show the 'empty' challenges (ones with no books yet). Added a new checkbox option to the widget, which allows you to display empty challenges.